Hey everybody, time for a quiz. Here’s 15 graphs of the pound’s exchange rate vs. the dollar. 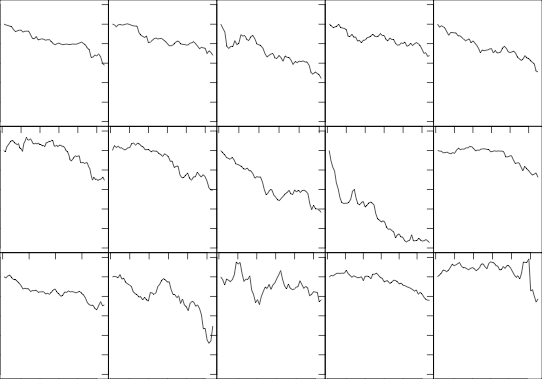 The scale is the same on all of them: 60 days on the horizontal axis, from 100 (the initial value) down to 75 on the vertical axis. So, which one is the past two months? Continue reading Which One Is Brexit? Posted on June 29, 2016 July 20, 2016 Tags Brexit, exchange rates, international finance and trade32 Comments on Which One Is Brexit? How Should We Count Debt Owed to the Fed? How big is US government debt? If you google this question looking for a number, your first hit is likely to be a site like this, giving a figure (as of June 2016) around $19.5 trillion, or a bit over 100 percent of GDP. That’s the total public debt as reported by the US Treasury. Debt held by the public is meant to exclude debt the federal government owes to itself. For the US, that means subtracting the $2.8 trillion in debt held by the Social Security trust fund, the $1.7 trillion held by by federal employee retirement funds, and $1 trillion various other federal trust funds. It leaves in, however, the debt held by the Federal Reserve. I wonder how many people, the sort of people who read this blog, know that. I wonder how many people know that today, one fifth of the federal debt “held by the public” is actually held by the Fed. I certainly didn’t, until recently. 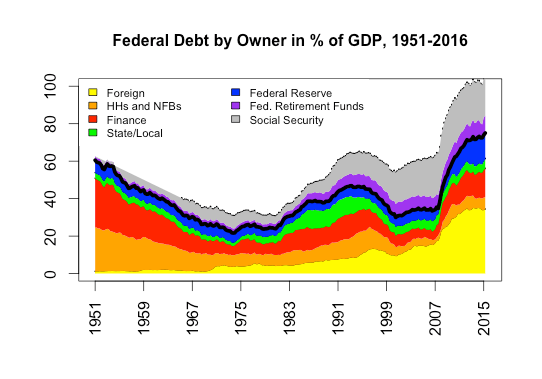 As you can see, the Fed accounts for quite a bit of federal debt holdings — $2.5 trillion, 16 percent of GDP, or 19 percent of debt “held by the public”. There’s some other interesting stuff in there. Most obviously, the dramatic fall in the share of debt held by households and nonfinancial businesses (the orange area), and rise of the foreign share (yellow). In the 1950s Abba Lerner could talk with some plausibility about the demand-boosting effects of federal interest payments to households; but it’s silly to suggest — as some modern Lernerians do — that higher rates might boost demand through this channel today. The declining share of the financial sector (red) is also interesting. I’ve suggested that this was a factor in rising liquidity premiums and financial fragility. If, as Zoltan Pozsar argues, we’re seeing a lasting shift from “market liquidity” to “base liquidity” this may include a permanently larger share of federal debt on bank balance sheets. If you want to say that debt held by the Fed definitely shouldn’t be counted, I won’t object. After all, any interest earnings on the debt are simply returned to the Treasury at the end of the year, so this debt literally represents payments the government is making to itself. But that’s not what I want to say. To be honest, I can see valid arguments on both sides — yes, the Fed is a part of government just as much as the Social Security Administration; but on the other hand, the Fed’s holdings were acquired in market purchases from the private sector, while the holdings of the various trust funds are nonmarketable securities that exist only as bookkeeping devices for future payments to beneficiaries. And if you think the Fed will reduce its holdings in the near future, then it makes sense to count them for any target you might have for holdings by the private sector. But of course, in that case how much you count them will depend on whether, when and how much you think the Fed will unwind its 2009-2013 balance sheet expansions. And this is my point: There is no true level of the federal debt. The “debt” is not an object out in the world. It is a way of talking about some set of the payment commitments by some set of economic units, sets whose boundaries are inherently arbitrary. Again, debt “held by the public” does not include the notional debt in the Social Security Trust Fund, or in the various retirement funds for federal employees. But what about the debt (currently about 5 percent of GDP) held by state and local governments in similar trust funds? Fundamentally, these represent commitments by the federal government to help with pension payments to retired state and local government employees. But this is the same commitment embodied in the Social Security Trust Fund. And on the other hand, the federal government has a vast number of payment commitments to state and local governments — transfers from the federal government make up more than a quarter of total state government revenue. Why count the commitments that happen to be recorded as debt holding in retirement funds as federal debt but not the rest of them? For that matter, what about the future claims of Social Security recipients? They certainly represent payment commitments by the federal government. Lawrence Kotlikoff thinks there is no difference between the commitment to make future Social Security payments and the commitment to make payments on the debt, so we should add them up and say debt held by the public is over 200 percent of GDP. Other people want to add in public pensions of all kinds. Why not throw in Medicare, too? True, retirement benefits are not marketable, but checking your expected benefits at https://www.ssa.gov/myaccount is not much harder than checking your bank balance online. And for the MMT-inclined, don’t future Social Security benefits have as good a claim to be “net wealth” for the private sector as federal debt, maybe better? One takeaway from all this is the point eloquently made by Merijn Knibbe, that one of the big problems in the economics profession today is the complete disconnect between theory and measurement. Most public discussions and economic models — and a lot of empirical work for that matter — treat “debt” as an object that simply exists in the world. (It’s worth noting that the question of how exactly debt is defined, and who it is owed to, does get some attention in undergraduate econ textbooks, but none at all in graduate ones.) It seems to me that the large share of debt held by central banks is a case in point of how we have to make a conscious choice about which commitments we classify as “debt”, and recognize that the best place to draw the line is going to depend on the question we’re asking. We need to treat economic categories like debt not as primitives but as provisional shorthand, and we need to be constantly walking back and forth between our abstractions and the concrete phenomena they are trying to describe. You can’t, it seems to me, do useful scholarship on something like government debt, except on the basis of a deep engagement with the concrete practices and public debates that the term is part of. More concretely: Whenever you take a functional finance line, someone is going to stand up and start demanding in a prosecutorial tone whether you really think government debt could rise to 10 times or 100 times GDP. How about 1,000 times? a million times? — until you say something noncommittal and move on to the next question (or mute them on Twitter). But of course the answer is, it depends. It depends, first, on the concrete institutional arrangements under which debt is held, which determine both economic impacts and financial constraints, if any. (For example, whether the debt held by central banks should be counted as held by the public depends on when or if those positions will be unwound.) And it depends, second, on how we are counting debt. Consider a trust fund holding federal debt. What the federal government has actually committed to is a stream of payments in the future which in turn will allow the fund to fulfill its own payment commitments. Converting that flow of future payments to a liability stock in the present depends on the discount rate we assign to them. But we can follow that same procedure for any future spending, whether or not it is officially recognized as someone’s asset. As Dean Baker likes to say, given that we don’t prefund education, the military, etc., pretty much all government spending could be called an unfunded liability for the federal government. How big a liability depends on the discount rate. If the discount rate is less than the nominal growth rate, then the present value of future spending grows without limit as we consider longer periods. So yeah. 20 percent of debt “held by the public” is actually owed to the Fed. An interesting fact which perhaps you did not know. UPDATE: As commenter Matt points out below, the math in the next-to-last paragraph is wrong. The calculation as given yields $110 trillion, a measly 600 percent of GDP. On the other hand, if we stretch it out to the next 30 years, we get nearly $200 trillion, which is 1,000 percent of GDP or more than $600,000 per person. I guess that will do. Posted on June 21, 2016 June 24, 2016 Tags debt, functional finance, lost in fiscal space, nominalism, the money view20 Comments on How Should We Count Debt Owed to the Fed? One auction is hardly dispositive, but that huge foreign demand is worth keeping in mind when we think about the US fiscal and external deficits. A point that Ryan Cooper also makes well. Unto the tenth generation. If you are going to make an argument for Britain leaving the euro, it seems to me that Steve Keen has the right one. The fundamental issue is not the direct economic effects of membership in the EU (which are probably exaggerated in any case.) The issue is the political economy. First, the EU lacks democratic legitimacy, it effectively shifts power away from elected national governments, while Europe-wide democracy remains an empty shell. And second, European institutions are committed to an agenda of liberalization and austerity. I wish I knew where this sort of thing came from. Maybe Brexit would reduce employment in the UK, maybe it wouldn’t — this is not the sort of thing that can be asserted as an unambiguous matter of fact. Whether it’s EU membership or taxes or trade or the minimum wage, everyone claims their preferred policy will lead to higher living standards than the alternatives. Chris Bertram seems like a reasonable person, I doubt that, in general, he wishes suffering on the children of people who see policy questions differently than he does. But on this one, disagreement is impermissible. Why? The first is what I call “coffee-house macro,” and it’s what you hear in a lot of casual discussions. It often revolves around the ideas of dead sages — Friedrich Hayek, Hyman Minsky and John Maynard Keynes. The second is finance macro. This consists of private-sector economists and consultants who try to read the tea leaves on interest rates, unemployment, inflation and other indicators in order to predict the future of asset prices (usually bond prices). It mostly uses simple math, … always includes a hefty dose of personal guesswork. The third is academic macro. This traditionally involves professors making toy models of the economy — since the early ’80s, these have almost exclusively been DSGE models … most people outside the discipline who take one look at these models immediately think they’re kind of a joke. It’s fair to say a lot of us here in the coffeehouses were pleased by this piece. Obviously, you can quibble with the details of his list. But it gets a couple of big things right. First, the fundamental problem with academic macroeconomics is not that it’s a study of the concrete phenomena of “the economy” that has gone wrong in some way, but a self-contained activity. The purpose of models isn’t to explain anything, it’s just to satisfy the aesthetic standards of the profession. As my friend Suresh put it once, the best way to think about economics is a kind of haiku with Euler equations. I think a lot of people on the left miss this — they think that you can criticize economic by pointing out some discrepancy with the real world. But that’s like saying that chess is flawed because in medieval Europe there were many more knights than bishops. The other thing I think Noah’s piece gets right is there is no such thing as “economic orthodoxy.” There are various different orthodoxies — the orthodoxy of the academy, the orthodoxy of business and finance, the orthodoxy of policymakers — and they don’t agree with each other. On some important dimensions they hardly even make contact. Merijn Knibbe also likes the Bloomberg piece. (He’s doing very good work exploring these same cleavages.) Noah follows up on his blog. Justin Wolfers rejects basically everything taught as macroeconomics in grad school. DeLong makes a distinction between good and bad academic economics which to me, frankly, looks like wishful thinking. Brian Romanchuk has some interesting thoughts on this conversation. Before the LCR, banks were required to hold reserves only against demand deposits issued in the U.S. … As banks went about their usual business of making loans and creating deposits, they routinely fell short of reserve requirements. To top up their reserve balances, banks with a shortfall of reserves … borrowed fed funds from banks with a surplus of reserves… These transactions comprised the fed funds market. 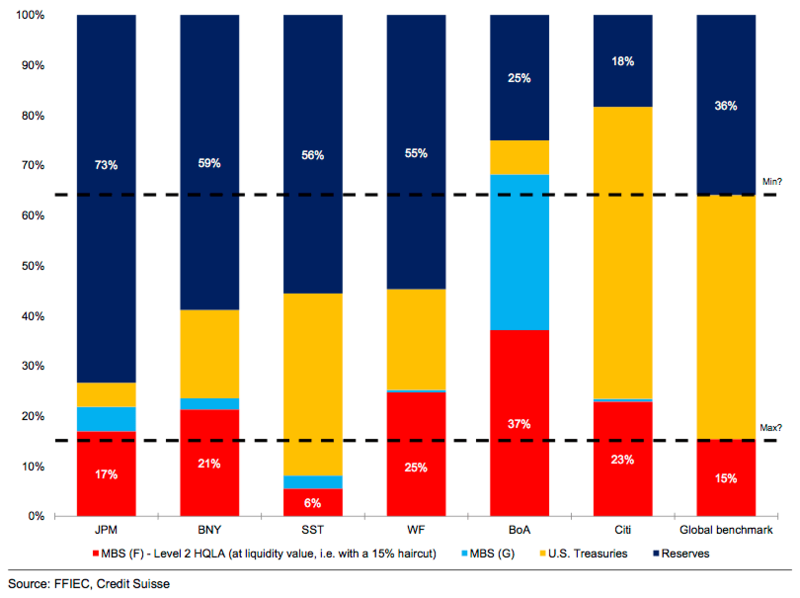 The idea is this: Under the new Basel III rules, which the US has adopted, banks are required to hold liquid assets equal to their total liabilities due in 30 days or less. This calculation is supposed to include liabilities of all kinds, across all the bank’s affiliates and subsidiaries, inside and outside the US. Most of this requirement must be satisfied with a short list of “Tier I” assets, which includes central bank reserves. So reserves that are excess with respect to the old (effectively moot) reserve requirements, will not be to the extent that they are held to satisfy these new rules. Pozsar’s discussion of these issues is extremely informative. But his “no one penny” language may be a bit exaggerated. While the exact rules are still being finalized, it looks like current reserve holdings could still be excessive under LCR. Whie banks have to hold unencumbered liquid assets equal to thier short-term liabilities, the fraction that has to be reserves specifically is still being determined — Pozsar suggests the most likely fraction is 15 percent. He gives data for six big banks, four of which hold more reserves than required by that standard — though on the other hand, five of the six hold less total Tier I liquid assets than they will need. (That’s the “max” line in the figure — the “min” line is 15 percent.) But even if current reserve holdings turn out to be more than is required by LCR, it’s clear that there are far less excess reserves than one would think using the old requirements. Pozsar draws several interesting conclusions from these facts. First, the Federal Funds rate is dead for good as a tool of policy. (I wonder how long it will take textbook writers to catch up.) Second, central bank balance sheets are not going to shrink back to “normal” any time in the foreseeable future. Third, this is a step along the way to the Fed becoming the world’s central bank, de facto in even in a sense de jure. (Especially in conjunction with the permanent swap lines with other central banks, another insitutional evolution that has not gotten the attention it deserves.) A conclusion that he does not draw, but perhaps should have, is that this is another reason not to worry about demand for Treasury debt. There are good prudential reasons for requiring banks to hold government liabilities, but in effect it is also a form of financial repression. This is also a good illustration of Noah’s point about the disconnect between academic economics and policy/finance economics. Academic economists are obsessed with “the” interest rate, which they map to the entirely unrelated intertemporal price called “interest rate” in the Walrasian system. Fundamentally what central banks do is determine the pace of credit expansion, which historically has involved a great variety of policy tools. Yes, for a while the tool of choice was an overnight interbank rate. But not anymore. And whatever the mix of immediate targets and instruments will be going forward, it’s a safe bet it won’t return to what it was in the past. Here are some books I’ve read recently. This little book may have the highest insights-per-page density of any economics book I’ve read. This isn’t an unmixed blessing — what you’re getting here are the distilled conclusions of a lifetime’s work in development economics, without any of the concrete material that led to them. The central theme — among many fascinating side-trips — is a basically Ricardian vision of a three-class society in which conditions in agriculture fundamentally determine the possibilities for capitalist development, and landlords are the great enemies of progress. Among the book’s many virtues is the way it demonstrates how Ricardo’s theories of trade has much more radical implications than the free-trade-is-good bromides it’s usually deployed in support of. As Lewis points out, the Ricardian model clearly shows that it is in the interests of the rich countries that poor countries develop their capacity to produce goods they are already specialized in (i.e. follow their comparative advantage). But it is in the interest of the poor countries themselves (except for the landlords) to develop their capacity to produce the goods currently produced by the rich countries. Originally I’d picked up some other history of the pre-Civil War United States. It referred dismissively to the idea that resistance to wage labor and to production for profit had been important to political and social developments in the early United States, and referenced The Market Revolution as the leading example of this now-discredited view. Ah, I thought, that’s the book I should be reading. I was not disappointed. The transition from use-value production by family units to market production by wage (and slave) labor turns out to be a very effective tool for organizing a general political and social history of the US from the end of the War of 1812 to the 1840s. I’d had this sitting around for ages and for some reason picked it up when I was unpacking a box of books. It’s a history of evolution, told through the conceit of a pilgrimage from modern humans back to the origins of life. Each pilgrim represents the last common ancestor of us and some other group of organisms. It may not be obvious at first but there is a definite number of such meeting points, no more than a few dozen, though obviously there is quite a bit of uncertainty about the more distant ones. It’s a very effective device for telling the story of evolution in an unfamiliar way, and, thankfully, Dawkins’ cranky politics are confined to a few footnotes. Someone recommend this book to me in comments on this blog. It’s an original retelling of the story of Japan’s long postwar boom and long post-1980s stagnation that puts monetary policy at the center of both. The basic argument is that the distinctive features of Japanese capitalism are a product of wartime mobilization, not some ancient features of Japanese culture; Werner’s claim that 1920s Japan was as liberal as the US or UK on most economic dimensions is consistent with other things I’ve read. The central feature of wartime planning that was preserved after 1945 was direct allocation of credit by the state — not officially, but via “window guidance” to banks on the desired volume and direction of lending. Initially this was controlled by the Ministry of Finance but in the 1980s, Werner argues, the Bank of Japan became increasing independent, and the key decisionmakers there — the “princes of the yen” of the title — saw their control over credit as a tool to dismantle the distinctive features of postwar Japanese capitalism. His claim that the crisis was deliberately provoke and prolonged in order to push through a broader agenda of liberalization is highly relevant as a precedent for what’s happening in Europe today — though I have to admit that his evidence for it is more suggestive than dispositive. I stole this from Mike Konczal when I was visiting him last year; he was using it for a piece in The Nation. It’s a fascinating discussion of a question I’d never thought about much before — the legal status of dead people. The argument is that the US is an outlier, in that it grants dead people no rights over their bodies — instructions about the disposal of remains have no legal force — but grants wealthowners almost unlimited freedom to dispose of their property however they wish. In most European countries, by contrast, children and other family members are entitled to a substantial share of the estate regardless of the wishes of the deceased. Piketty, incidentally, is critical of these rules, on the grounds that they reinforce inherited wealth, but the US has its own ways of maintaining fortunes across generations. As Madoff points out, the “rule against perpetuities” now exists only in law school classrooms. While at one time it was possible to leave wealth in trust only for named individuals, it is now perfectly possible to set up a trust to benefit your decendents unto the last generation. Even better, you can keep your property itself in the trust, allowing your heirs only an income, or the use of it (as with a house); this protects it from the taxman, your children’s creditors, and their own spendthrift ways. Of course the law is not the whole story here; whether the US has the norms and institutions to actually maintain such perpetual wealth remains to be seen. If you’ve read Kolbert’s pieces on climate change in the New Yorker then you know what this book is like. It’s a good, readable summary of what we know about the mass extinction currently underway. There’s nothing really new here, but one thing I did learn from it is how much of what’s happening is due to factors other than warming per se. Ocean acidification is responsible for the extinction of coral, which may be completely gone by the end of the century; invasive species and the dissemination of pathogens is the main factor in the decline of bats and amphibians. No matter how familiar you think you are with this stuff there’s always something that hits you. I remember my fascination and disgust as a child when I learned there were frogs that swallowed their eggs and hatched the tadpoles in their stomachs. It turns out there aren’t anymore. The central claim of Boehm’s previous book is that all the small bands of foragers we know of — the closest analogues to the societies that existed for 99 percent of human history — are strictly egalitarian, with no one (among adult males) allowed to assume authority over anyone else. This contrasts with the modern world of kings, cops and bosses, and even more so with the rigid dominance hierarchies of our nearest primate relatives. And yet there is a striking parallel between the alliances that dominant chimpanzees form to defend their top spot, and the alliances that entire groups of human beings form to prevent anyone from occupying the top spot in the first place. Boehm’s idea — which I like a lot, though I don’t have any expertise — is that the same basic behavioral patterns, presumably with the same genetic underpinnings, can produce dramatically different kinds of society. An intense dislike of having people above you, plus the ability to form alliances against anyone who tries to move up in the ranks, are the ingredients for a world of chimpanzees, baboons, mafiosos and orcs, where everyone is jealously guarding their spot in the hierarchy and ready to violently retaliate against usurpers who try to cut ahead of them. But the same vigilance against anyone trying to put themselves above you can equally give rise to the absolute democracy of hunter-gatherer bands, or today to political movements like Occupy Wall Street. The main thing the newer book adds to the story is a more explicit argument that egalitarian norms arose through natural selection, along the same lines as people like Bowles and Gintis. I am not sure this evolutionary turn is a step forward. Like all evolutionary psychology, this consists largely of speculative just-so stories. And it loses one of the most interesting ideas in the earlier work, that the same behavioral building blocks can give rise to both hierarchical and egalitarian forms of society. I liked all of them a lot, would recommend them all. Maybe I’ll write mini-reviews in an another post. Or maybe not. is not equal, thanks to the special role of the U.S. in the world economy. The global economy today operates on what is effectively a dollar standard: The U.S. dollar serves as the international currency, the way gold did under under the gold standard. In part for this reason, the U.S. can finance trade deficits indefinitely while most other countries cannot. For many of our trade partners, any reduction of net exports would imply unsustainable trade deficits. So policies intended to improve the U.S. trade balance are likely to instead lead to lower growth elsewhere, imposing large costs on the rest of the world with little or no benefits here. We do not deny that the trade deficit has negative effects on demand and employment in the U.S., but we argue this is only a reason to redouble efforts to boost domestic demand. The solution to the contractionary effects of the trade deficit is not a costly, and probably futile, effort to move toward a trade surplus, but rather measures to boost investment in both the public and private sector. You can read the rest of my piece here. There were a couple figures that didn’t make it into the final piece. Here is one, showing the stability of the international role of the dollar over the past 20 years. 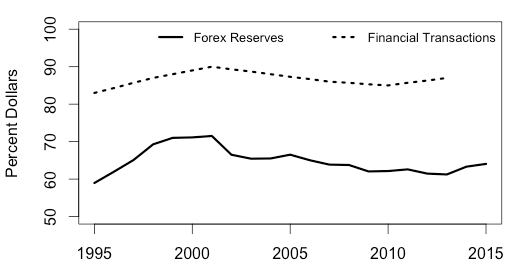 The dotted line shows the share of central bank reserves held in dollars (source). The heavy line shows the share of foreign-exchange transactions that involve the dollar (source). About two-thirds of foreign exchange reserves are held in dollars, and close to 90 percent of foreign-exchange transactions involve the dollar and some other currency. These shares have not diminished at all over the past 20 years, despite continuous US trade deficits. In my opinion, the international role of the dollar makes it exceedingly unlikely that the US could face a sudden outflow of foreign investment. (And given that US liabilities are overwhelmingly dollar-denominated, it is not clear what the costs of such an outflow would be.) It also makes it highly unlikely that the US can achieve balanced trade through conventional measures, unless we come up with some other mechanism to provide the rest of the world with dollar liquidity.